(0 Customer Reviews) | Write Review 4 issues per year ABBINGDON AUCTIONS CATALOGUE : Australia's only specialised doll, bear and collectables auctioneers Abbingdon Auctions Australia in 2013 have sold dolls to $22,500 and bears to $5,000. Their catalogues are treasured by collectors as a reference guide, with over 100 wonderful full gloss colour pictures of featured lots and 24 pages full of information and detailed descriptions; this is the bible for doll and bear collectors in Australia. Abbingdon's world wide absentee bidding serivce, ships dolls and bears to over four different countries each auction and receive bids from around the world every auction. They are one of the World's most respected authorities on dolls and bears. Abbingdon staff give collecting lectures around Australia, if you don't have their catalogue, you don't have access to the investment type collectable dolls and bears available. Buy a subscription now to the Abbingdon Auctions Australia catalogue and unlock the wonderful collecting world of dolls and bears. 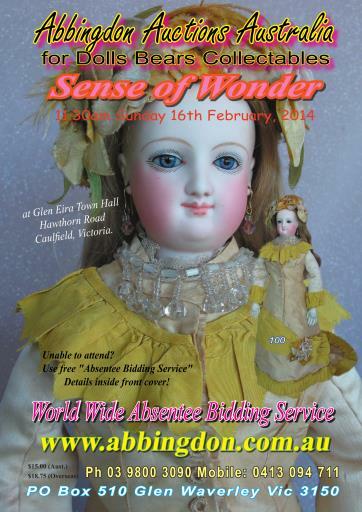 Abbingdon Auctions, Australia's leading doll, bear and collectable auctioneers present "Sense of Wonder" on 16th February 2014. Featuring antique French and German bisque dolls with Smiling Bru Fashion, Black French Fashion, all original Gibson Girl, Simon & Halbig Oriental. Bears feature a rare swivel head Joy Toys and 1910 Steiff bear and 1920s Steiff lamb on wheels. Also selling MOC Mego Aqualad and other Mego Super Heroes. Over 340 lots to please all budgets. ABBINGDON AUCTIONS CATALOGUE : Australia's only specialised doll, bear and collectables auctioneers Abbingdon Auctions Australia in 2013 have sold dolls to $22,500 and bears to $5,000. Their catalogues are treasured by collectors as a reference guide, with over 100 wonderful full gloss colour pictures of featured lots and 24 pages full of information and detailed descriptions; this is the bible for doll and bear collectors in Australia. You'll receive 4 issues during a 1 year Abbingdon Auctions magazine subscription. You'll receive 4 issues during a 1 year Abbingdon Auctions magazine print subscription.